The Archies have finally come face to face with The Monkees in a brand new Archies comic. 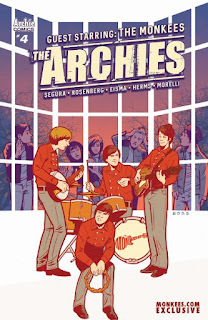 In the forth issue of The Archies comic book some good old fashioned time-travel sends Archie Andrews and friends back to the 1960s where they come face to face with Peter, Davy, Mickey and Mike. In the current Archies comics The Archies are on tour. In the last comic book they met the more contemporary Chvrches. The issue will be in comic book stores and available digitally January 17 2018.